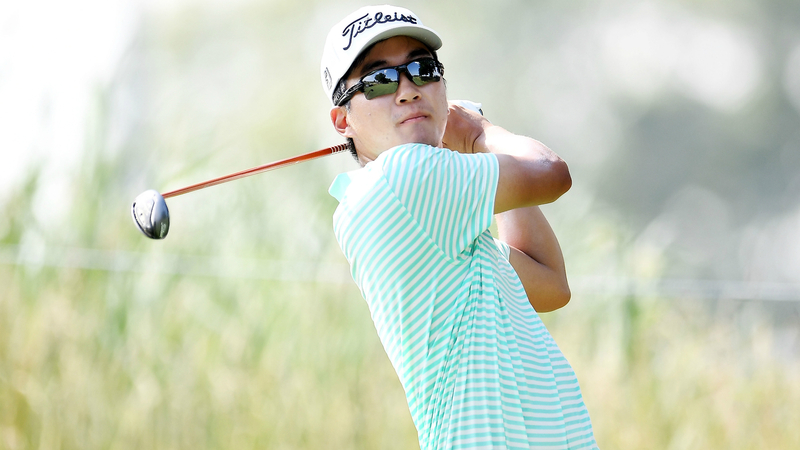 Michael Kim earned a commanding four-stroke lead during a weather-interrupted second round at the John Deere Classic. The American had one hole remaining when play was suspended due to inclement weather in Silvis, Illinois Friday. Kim, who celebrates his 25th birthday Saturday as he searches for his first PGA Tour title, was flawless having carded eight birdies without dropping a shot. The South Korean-born golfer, on the verge of a second successive 63, will return to complete his second round at TPC Deere Run early Saturday. David Hearn (64), Steve Wheatcroft (68) and Johnson Wagner (66) are four shots back and 12 under through 36 holes of the PGA Tour tournament. Francesco Molinari (66), Matt Jones (63) and Bronson Burgoon (through 15) are a stroke further back heading into day three. Zach Johnson, the 2012 winner, avoided the cut by just one shot following his 1-under 70 before the weekend.